When Chris Allard was 10, he sketched a 23-foot powerboat of his own design, something he often did at that age. He liked it so much he thought Boston Whaler should build it. Showing a fair amount of gumption for a child, he mailed the drawing to the company’s president, asking him to do just that. And that’s what Allard did. He grew up around boats on Long Island, N.Y., living aboard trawlers with his parents and his sister during the summer. He moved on to restore a 1968 classic 18-foot Donzi, which he still owns, and graduated from the Webb Institute in Glen Cove, N.Y., where he earned a bachelor’s degree in naval architecture and marine engineering. Allard is now 29 and president of Metal Shark Aluminum Boats, based in Jeanerette, La. 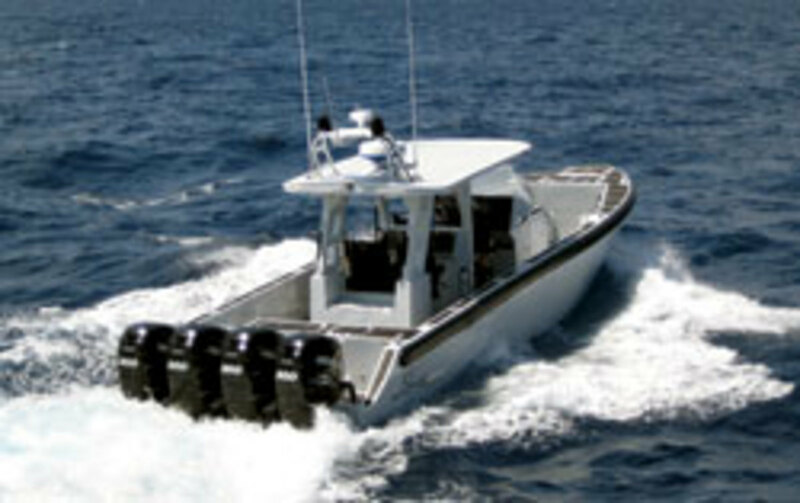 A subsidiary of Gravois Aluminum Boats, Metal Shark builds high-speed welded-aluminum patrol and rescue vessels for the Coast Guard, Navy and Army, and for law enforcement and fire/rescue organizations throughout the United States and abroad (www.metalsharkboats.com). In September, after a lengthy bidding process and the production of a prototype built to meet performance requirements specified by the Coast Guard, Metal Shark was awarded a $193 million contract — with fulfillment to run seven or so years — to build 500 Response Boats-Small for use by the Coast Guard, Customs and Border Protection and the Navy. The Coast Guard announced its initial delivery order Sept. 28 of 38 boats worth approximately $13 million. 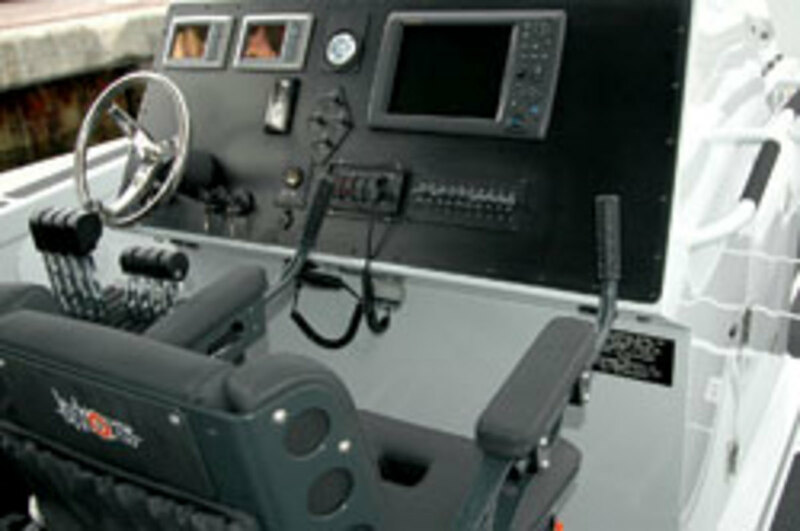 The company has been steadily growing, Allard says, and part of that expansion led to a foray into the recreational market with the introduction in 2008 of the 35 Courageous, a rugged 35-foot offshore center console designed specifically for anglers who fish hard and often in rough conditions. To date, the company has built 15 of these boats and, says Allard, interest in the Courageous remains strong. The 35 Courageous rides a deep-vee hull and is powered by twin 350-hp or triple 300-hp outboards — typically Mercury or Yamaha 4-strokes. Cruising speed ranges from 40 to 45 mph, and the boat has a top end of 65 mph with the triple-engine configuration. Allard says the boat is only available factory-direct. A national dealer network for service and warranty work is in place in most regions, and locations where it is not are served with factory personnel. Depending on options, delivery of a finished boat can take between 120 and 180 days. A fully outfitted 35 Courageous, with electronics, engines and a trailer, costs roughly $250,000 and can handle 12 passengers. Bigger is evidently better, according to Allard. Based on the trends he is seeing, buyers in the recreational and non-recreational markets are going for larger boats of superior quality. In the past three years, the bulk of the company’s sales have gone from boats of 25 feet to those of 35 feet or more, though Allard attributes this mostly to the requirements of its core military and commercial customers, who are looking for larger vessels. The company typically sold about 100 units annually through 2010, but that number decreased this year because of an emphasis on bigger boats that yielded higher prices per unit. The dollar volume in 2011 was about the same as that of 2010, Allard says. With the RB-S contract and other new ventures coming online, Allard expects the company to produce approximately 120 units in 2012 and a growth rate of 20 to 25 percent per year through 2015. The RB-S contract will amount to approximately 30 percent of Metal Shark’s production in the coming years, according to Allard. Designing and building bigger boats like the 35 Courageous and RB-S on a large scale requires state-of-the-art technology. The company’s five in-house naval architects use 3-D rendering software during the design process, and on the factory floor some of the company’s 80 full-time employees use computer-guided routers and other equipment to build the boats. The company expects to add an additional 40 employees early in 2012, in part to meet the production schedule for the RB-S.
On the other hand, fiberglass construction offers cosmetic advantages that aluminum can’t. “There are some portions of a fiberglass boat that are prettier, cleaner and nicer than an aluminum boat,” he says. “The aluminum boat is for someone who wants industrial duty,” such as a charter captain or an angler who heads offshore all the time. Allard designed the 35 Courageous with his partner, Jimmy Gravois. They combined the high-tech construction methods used to build the government and military craft in the company’s 65,000-square-foot factory with Gravois’ more than 30 years designing and building recreational aluminum fishing boats. The Courageous just seemed to be a natural for the company, Allard says. 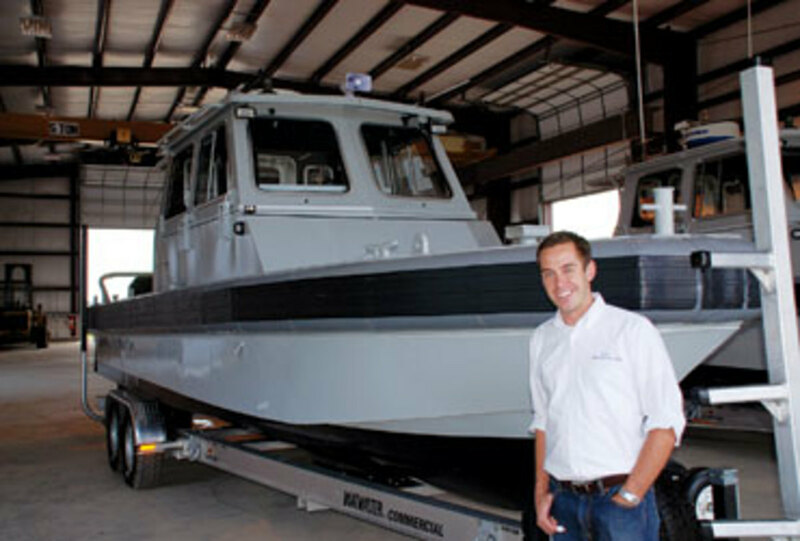 After interning at Donzi Marine while he was in college, Allard in 2005 went on to head the engineering and construction team at the commercial and military branch of American Marine Holdings, the parent company of Donzi Marine and Pro-Line Boats. That’s how he got his start building patrol and police vessels, although fiberglass was the preferred material at the time. In 2007, American Marine expanded to build these same boats out of aluminum, and the new division was called Metal Shark Boats. 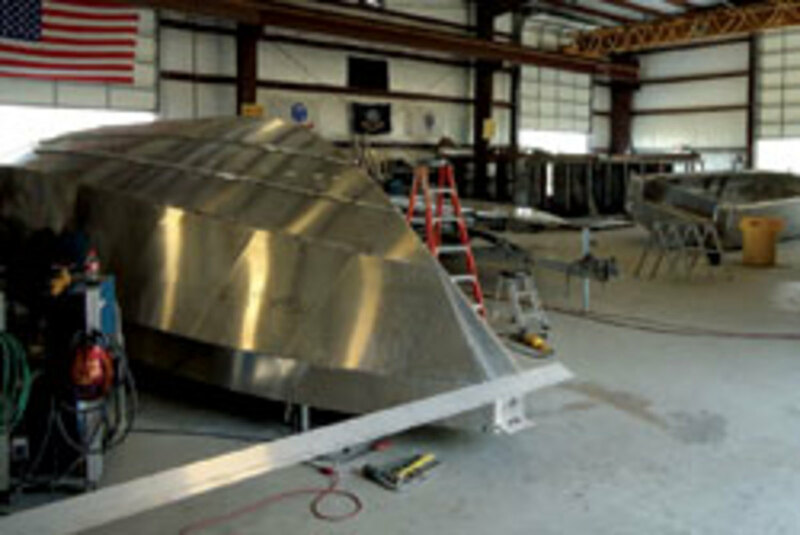 Gravois Aluminum Boats was named as the subcontractor. Later that year, American Marine decided to sell the aluminum-boat division, and Allard and Gravois acquired it. Since 2007 the company has expanded its facilities annually, adding 15,000 square feet to its 50,000 square-foot facility to date, with plans to add more space in late 2012 or early 2013. The expanded production capacity has enabled Metal Shark to more expeditiously meet its government orders, setting the stage to facilitate fulfillment of the RB-S contract, and to continue to dip its toe into the recreational market, something Allard and Gravois very much wanted to do from the start.